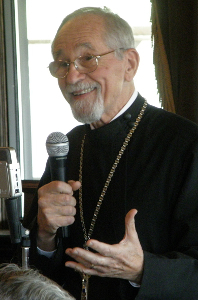 All services and visitations will be at the Orthodox Monastery of the Transfiguration, Ellwood City, PA.
Father Thomas’ body will be ushered into the monastery church at 10:00 a.m. on Friday morning, March 20. The Liturgy of the Presanctified Gifts will be celebrated at 11:00 a.m. Visitation will continue throughout the day on Friday, with the celebration of Matins for the Departed at 6:00 p.m. followed by a Panikhida at 7:30 p.m. Visitation will close at 9:00 p.m. that evening. On Saturday, March 21, the Memorial Divine Liturgy will be celebrated at 9:00 a.m. followed by a Panikhida. Visitation will continue throughout the day. The Vigil on Saturday evening will begin at 5:30 p.m. Visitation will close at 9:00 p.m. that evening. On Sunday, March 22, the Divine Liturgy will be celebrated at 9:30 a.m. followed by visitation throughout the afternoon. Vespers will be celebrated at 5:00 p.m. followed by a Panikhida at 6:00 p.m., with visitation continuing until 9:00 p.m.
On Monday, March 23, the Funeral Service for a Priest will be celebrated at 10:00 a.m., followed by interment in the monastery cemetery and a memorial meal.